If you've been downtown lately near Riverfront Park, you've probably noticed, like us, that there's been some construction near the Rotary Fountain, at the park's Howard Street and Spokane Falls Boulevard entrance. We decided to find out what's going on and what the park's plans are for the new building taking shape there. The Spokane Parks Department is currently in the process of planning for Riverfront Park's longterm future, including making long overdue infrastructure upgrades as part of a new and updated Riverfront Park Master Plan. (Our publisher wrote about his involvement this week.) One upgrade that park users will see and experience before the park's future is more firmly determined, though, is a new concessions and restroom facility; which the building now being constructed will house. The new building replaces the old Carousel Grill, a concession stand that was housed in a trailer just north of the fountain, as well as the mobile restrooms that were housed nearby. 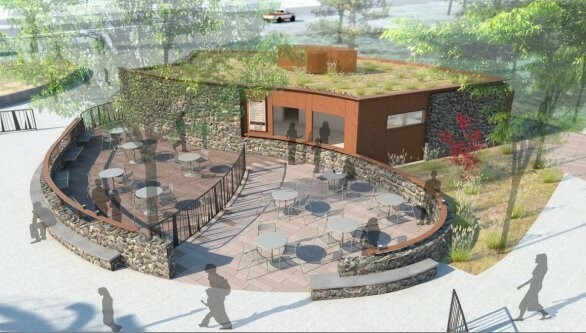 Called the Fountain Cafe, the new concessions facility will offer a more diverse menu and patio-style outdoor seating, as well as a separate beer and wine area, says Sam Song, the park department's food and beverage director. The cafe is set to be open in time for Bloomsday, on May 5, which draws thousands of locals and visitors to Riverfront Park. The modern facilities were designed by local firm NAC Architecture, and feature a natural-looking facade with stone accents and a curving wall around the patio area, with bench seating on both sides of the wall. Song estimates the cafe's patio will seat as many as 50 people. And though it's still a park concession stand, the parks department decided to create a menu that includes more than the traditional concessions fare of burgers, fries, hot dogs and ice cream. 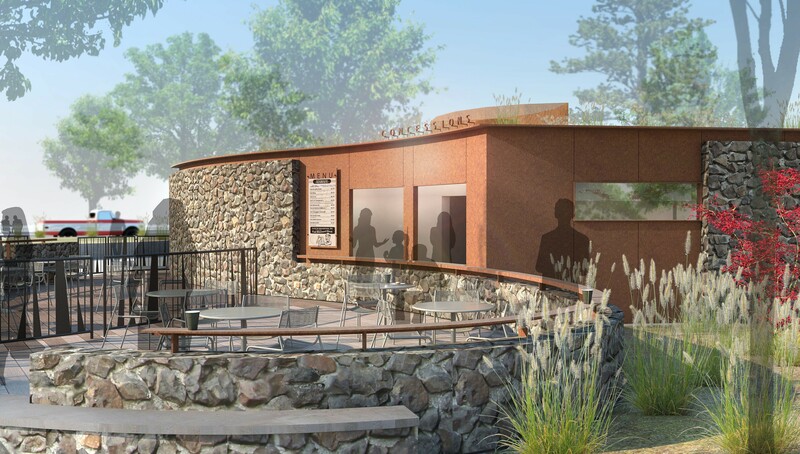 Using the popular Park Bench Cafe at Manito as an example, Song says the Fountain Cafe's menu will feature traditional fare along with healthier options like salads, wraps, flatbreads and hummus platters. Most entree items on the menu range from $6-$9.50. Another change from the food offerings at the Carousel Grill is the addition of a more varied kids menu, Song adds, partly because of the location near the Rotary Fountain, a popular attraction for kids in the warm weather. The cafe will offer one of No-Li Brewery's most popular beers on tap, as well as some bottled beers, and will focus on a selection of mostly, if not all, Washington wines. 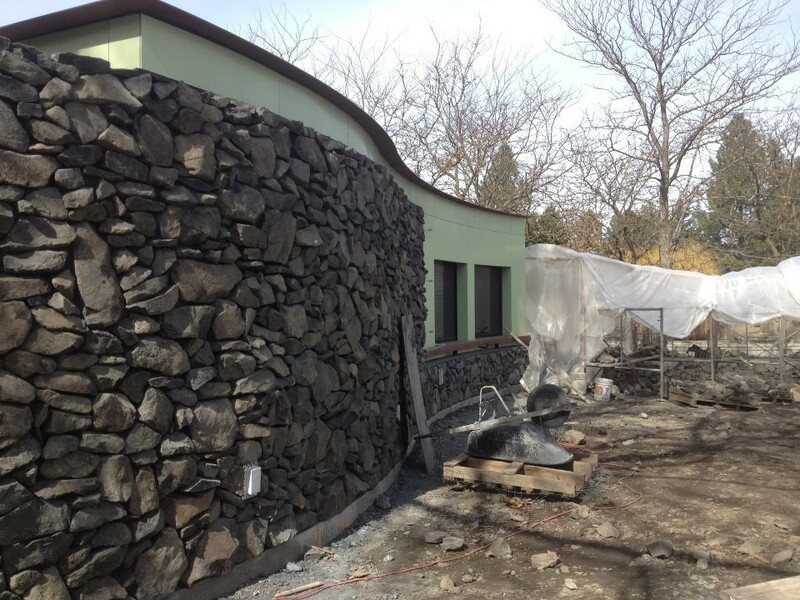 The new restroom facilities for that area of the park will be located on the back side of the cafe building. Song hopes the Fountain Cafe attracts more than just park users, like people who work at nearby downtown businesses and want to enjoy a meal outside on the patio. He hopes the cafe can eventually offer much more than food and beverages, such as becoming a venue for people to enjoy live music outdoors. "We want to see Riverfront Park thrive," he says. "Where else can you find a better place for so many downtown people and visitors to enjoy?" See photos of the Fountain Cafe's planned menu items and its construction progress on its Facebook page.